Recently I was bought some Ladybird books for my birthday. I got "How it Works, The Computer," "How It Works, Television," and "The Story Of Nuclear Power," all of which were mid-1960s easily digested thin children's hardbacks. 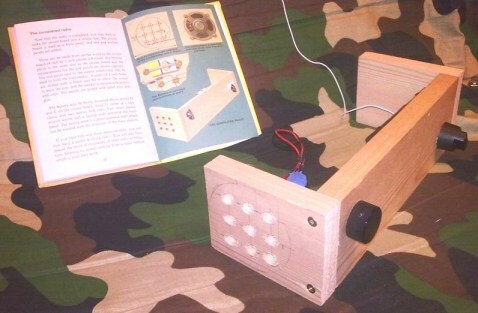 This encouraged me to buy "Learnabout... Making A Transistor Radio," which I'd had as a kid. It certainly tought me one thing about how to make a transistor radio, that being one specific method which, try as I might, I could not get to work. So, as I happened to have all of the parts available I thought that I would have a go at it in these enlightened times of the 21st century. Any excuse to blow out the dust from the 1960s germanium transistors drawer. Well you can see the pictures of the one I've made and the similarity to the illustrations in the book. There are some places where you could trip up. The 0A91 diodes that I had would have been inserted wrong way around if I'd followed the pictures, which show the 'red' end of the transparent 0A91as being the anode. This is probably due to design changes over time, and in my modern diodes the end with the red encapsulated termination was the cathode. You can tell which end is really anode or cathode by looking carefully to see which end the point contact wire is attached to, and which has the germanium crystal on a little mount. I also found that the first audio amplifier stage was fully saturated with the 0C81 transistors that came out of my drawer. This would probably not have been the case with a scabby old low beta 0C71 in that position, but the transistor that I had there was quite good and so would not work correctly. Before you complain that I used the wrong type, the parts list text says that you can use any red spot audio transistor. Sorry Ladybird books, but transistor beta dependent design is bad design. The symptom in my set was very low audio level which could only just be heard when the r.f. stage was in full oscillation. The simple solution is to fit a 1k Ohm emitter resistor in parallel with a 22uF bypass capacitor to ground, instead of a direct connection to ground. That stabilises the d.c. operating point while maintaining the audio gain. Interestingly, there is a spare screwcup position just where these parts are required. They fit neatly between position 5 and the previously unused position 6. Perhaps these components were present in an original design and were removed in a misguided attempt to save parts before publication. The final stage does not suffer in the same way, partly due to it operating in a transformer coupled class-C fashion, where the stored energy in the inductance provides half of the output swing. It is rather distorty, but cheap on current. I'm not sure why my attempt to build this in the 1970s failed so miserably. I suspect the problem with transistor beta mentioned above may have played a part, but I never even got mine to whistle. I do remember that the RF transistor that I had was a metal canned one. These were well known for failing, even when "new" with internal crystalline growths shorting out to the can, so maybe that was my problem. These trannies were pretty ancient history even in 1977, so that wouldn't be too surprising. The selectivity is very good indeed, though the whole set is rather 'live' and detunes a little when you move it or the short wire antenna. 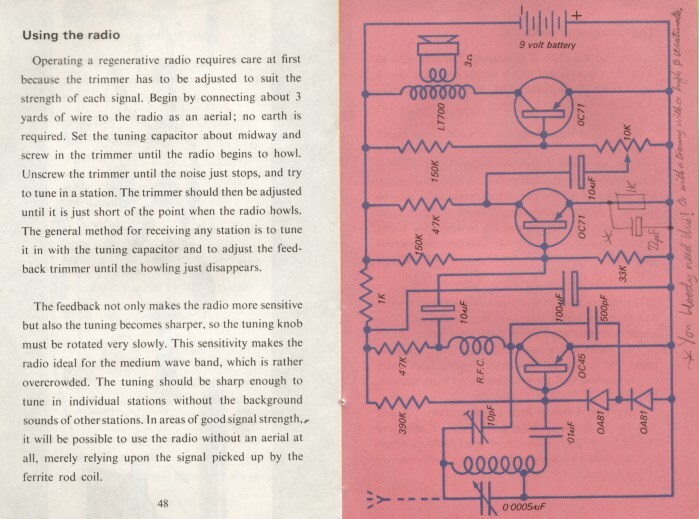 The setting of the reaction trimmer is, as stated in the book, a little tricky but neither of these phenomena stop the radio being usable, especially if you prefer one station. It's not stunningly loud, but I'm not going to grumble too much from 3 transistors. If you were going to give the kids something to do for their science project at the weekend, then you'd avoid this design due to the ancient transistors and the fairly expensive Jackson capacitor. They are about £10 but are still available. There is something to be said about building something up completely from separate parts though, and the brass screwcup on softwood technique is solderless, cheap, and has a bit of olde worlde charm to it. A Radio 4 Longwave version might be interesting and this could dispense with the main tuning capacitor. If you really want to make one of these for nostalgic reasons I've made up some kits of all the parts excluding softwood here: Ladybird Radio Kit Of Parts. While making up this kit I found some other interesting things to do with the substitute parts list which is in the back cover of the book. High gain, higher leakage low Vbe transistors, which all tend to go together in any given example can cause the output stage to do a miniature version of thermal runaway and cease to give any output at all. The transistor warms up a little then saturates, pulling 100mA or so through the d.c. resistance of the output transformer. The transistor and transformer usually survive, providing you're just using a small PP3 battery. Really, the output stage needs a low value emitter resistor and bypass capacitor like I've suggested for the previous audio stage. Using an OC71 here ensures that this shouldn't happen as there is some inherent emitter resistance and lower gain anyway. Also, I've had great trouble getting anything other than OC45s to work in the RF stage. OC44s and working AF116s tend to go into high frequency oscillation rather than operate with usable regeneration. I think that this is due to them having higher Ft, basically more gain at high frequency, and coupling around the loose layout involved with the screwcup design results in unwanted high frequency oscillations. I think what may have happened is that Rev. 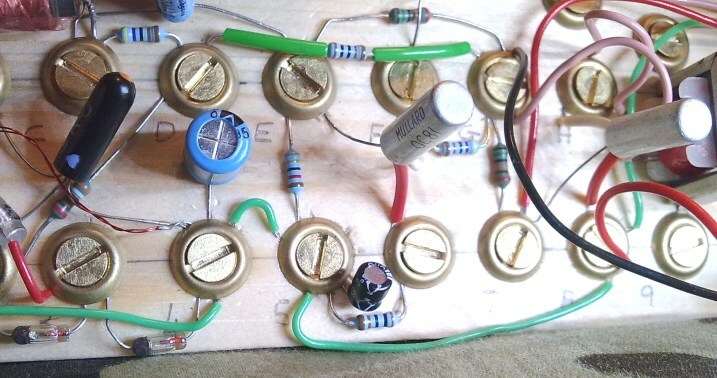 Dobbs designed his circuit and used cheap basic parts with the minimum of extras and simplest layout. Then along came the book, and a need for more general parts, so someone else had a look through the 1971 Mullard data book to look for alternatives, suggesting the newer parts listed by Mullard as replacements for the cheap but obsolete items. Not realising that in this design, the 'improved' transistor parameters could leave the target audience in heaps of trouble. I've tested the transistors supplied in the kit and you can use them without these problems. The air spaced capacitor supplied will need some different mounting scheme but they have a decent length of shaft and they are easier to tune with, requiring less turning force. Don't try to use plywood, MDF, a piece of solid oak from Grandad's wood shed or any other hardwood type substance as the baseboard. You will spend most of the afternoon trying to get the screws to go in, and get very bored when you find that the first hole that you've eventually mangled out with the bradawl is now too big for the screws to get a grip in. Some soft pine is what you want, and offcuts from the local DIY store are about 50pee. Well, if I get bored again I might decide to try a few variations. Replacing the transistors with something more modern is simple enough, and it would be good to get rid of that Jackson dilecon, perhaps replacing it with a "Mr Slidey," variable inductance ferrite on a stick arrangement. It would need more screwcups and perhaps smaller, no.8 ones, but a second output transistor in a class B stage would get rid of that transformer as well. Beyond that, we're probably talking superheterodyne designs with IFTs wound on biro plastic. But at that point it would probably be getting a bit complex, a dual gang variable capacitor would be back in and the fun element would be rapidly disappearing.